EPA: Tar Sands Pipelines Should Be Held To Different Standards Up until now, the U.S. has had the same rules for all oil pipelines. But the EPA says pipelines that carry tar sands oil, like the proposed Keystone XL pipeline, should have special standards. That's because tar sands oil spills can release harmful air pollution and are vastly more difficult to clean up than conventional oil spills. 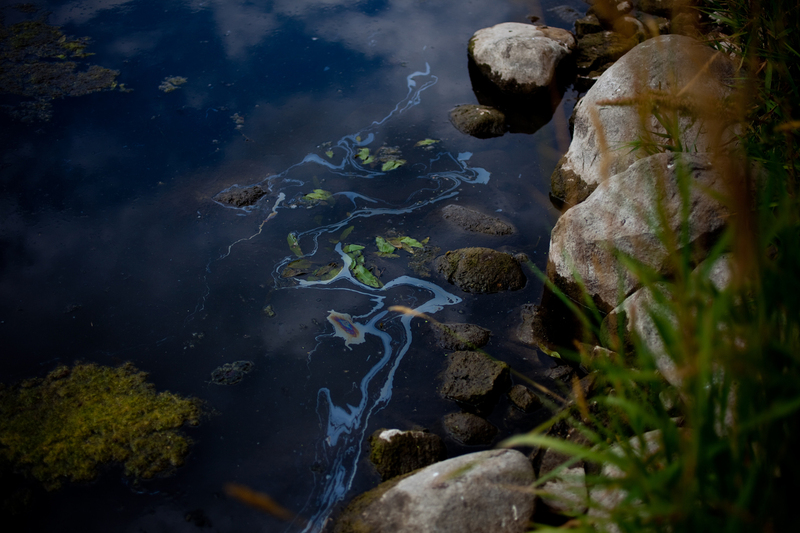 An oil sheen appears along the shore of the Kalamazoo River in August 2012. In July 2010, more than 800,000 gallons of tar sands oil entered Talmadge Creek and flowed into the Kalamazoo River, a Lake Michigan tributary. Heavy rains caused the river to overtop existing dams and carried oil 30 miles downstream. Up until now, pipelines that carry tar sands oil have been treated just like pipelines that carry any other oil. But the Environmental Protection Agency now says that should change. That's because when tar sands oil spills, it can be next to impossible to clean up. The agency made this argument in its evaluation of the State Department's environmental review of the Keystone XL pipeline project, which, if approved, would carry heavy crude from Alberta, Canada, to refineries in the United States. The EPA's letter urges the State Department to set special standards to prevent Keystone from spilling, and make sure any spills that happen are rapidly contained. The EPA says it has learned about the additional risks of tar sands spills from a cleanup of a 2010 tar sands spill into Michigan's Kalamazoo River that has dragged out nearly three years and cost more than $1 billion. A lot of the heavy crude sank to the bottom and hasn't biodegraded. Despite years of cleanup efforts, so much oil remains in the river bottom that the EPA recently ordered Enbridge, the company that operates the pipeline that spilled, to start dredging again. "We're coming into the third year of intensive cleanup activity, and now we're looking at very intrusive and expensive dredging to try to get it out of the worst places where it's accumulated behind three dams," says Stephen Hamilton, an ecology professor at Michigan State University, who is the independent science adviser to the cleanup. The EPA says another lesson of the 2010 Michigan spill is that tar sands spills can send harmful air pollution, such as benzene, into nearby communities. "Given these concerns, it is important to ensure that the future response and remediation plans will protect communities from impacts due to spills," the EPA's letter states. The EPA wants the State Department to require TransCanada to be ready, in case of a spill, with special equipment on hand to contain and clean up sunken oil. It also wants TransCanada to set up additional systems to detect leaks early, especially in ecologically sensitive areas and places where the pipeline crosses streams or near drinking water wells. TransCanada, the company that wants to build and operate the Keystone, says its project already includes 57 new safeguards. "We're talking about building the newest, safest pipeline that has been built to date in America," says Shawn Howard, a spokesman for TransCanada. Some environmental groups recently petitioned the federal government to set new regulations for pipelines that carry tar sands oil, and they see the EPA's letter as a strong indication that the EPA supports the additional safeguards. "This is the first time that an agency has come out and said that needs to happen, and we applaud them for that," says Beth Wallace, who has closely followed the EPA's response to the Michigan spill as a representative of the National Wildlife Federation. An EPA spokeswoman said the agency had no comment beyond its letter. Michigan State University professor Stephen Hamilton thinks more regulation is needed because of the many ways that a tar sands spill can be more harmful to the environment and people than a conventional oil spill. Another example he cited is that tar sands oil is a lot stickier than conventional crude, so everything it touches, even rocks, cannot be cleaned and needs to be thrown away. "The consequences and the costs of the cleanup, once it gets into surface water systems as we've seen in the case of the Kalamazoo River, are incredibly high," he says. "And, you know, we'll never get it all out." 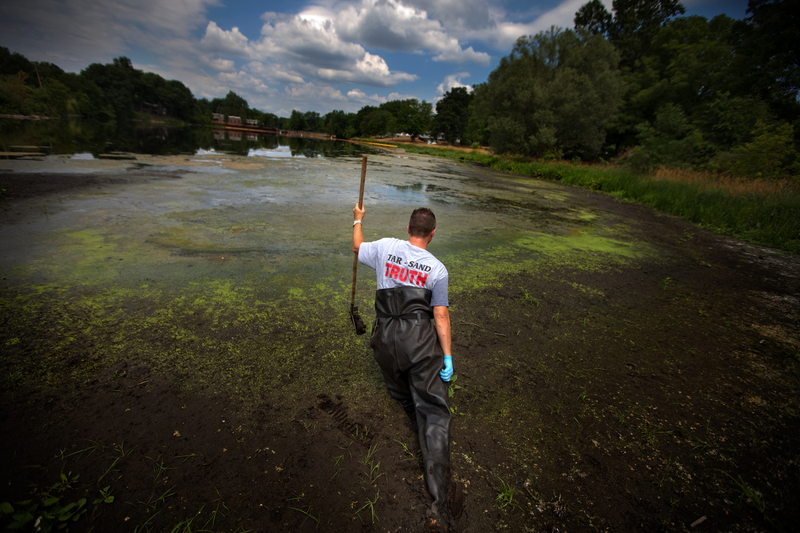 John Bolenbaugh wades through thick mud in the Kalamazoo River in August 2012, looking for leftover traces of oil from the July 2010 spill from the Enbridge oil sands pipeline. But Hamilton says even after all the damage he's seen from the Kalamazoo spill, there are bigger environmental risks from producing new sources of oil — the greenhouse gas emissions. 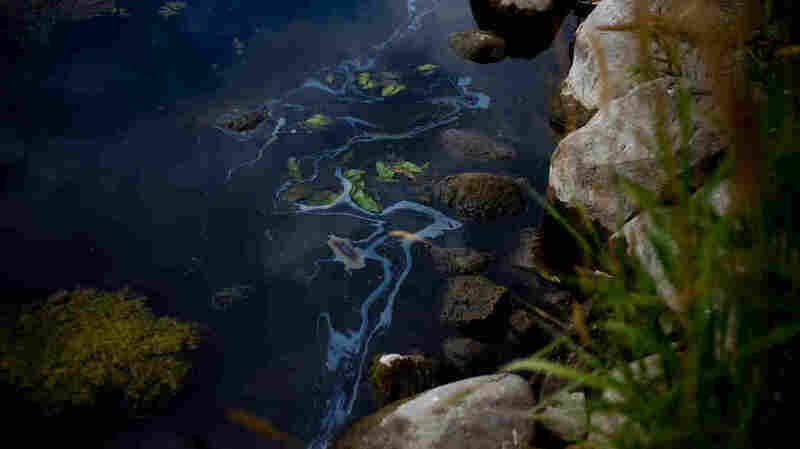 "Oil spills, as ugly as they are in the short term, ecosystems do eventually recover. It's quite different for the carbon that we're pumping into the atmosphere — that's going to be with humanity for centuries with its negative implications," Hamilton says. "So that's a much more worrisome issue." It takes a lot more energy to produce tar sands oil than the conventional variety, so the former has a larger greenhouse gas footprint. The EPA also says in its critique that the U.S. should work with Canada to figure out ways to reduce the greenhouse gases that come from getting tar sands oil out of the ground and turning it into gasoline.